How to feed this shrimp? 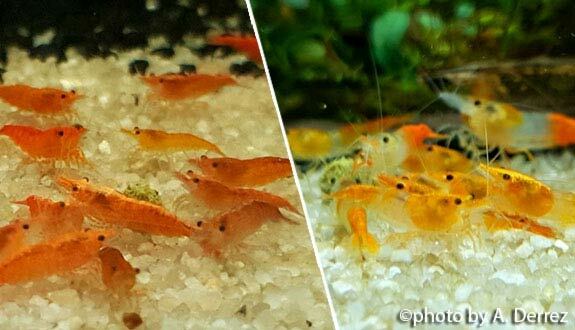 Be careful however, an excess of food can cause the death of the shrimp, because of the waste accumulating in the aquarium. 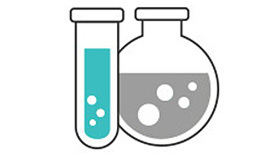 Your water is loaded with NO3 nitrates which can be deadly. Therefore, we recommend to feed less, but often. What kind of behavior does the shrimp have? 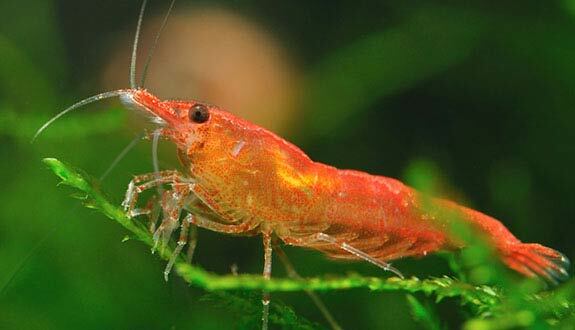 Shrimps tend to live at the bottom of the aquarium, where they will spend all their time foraging. It is a gregarious animal that likes to live together: adopt at least 6 individuals. Its behavior in the aquarium is a delight: extremely peaceful with its congeners as with all fish. It can, however, be a little shy sometimes. Even in very large groups, no dispute is observable. Who can live with this shrimp? 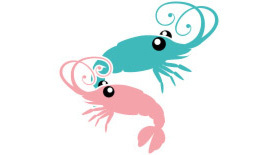 But in general, the cohabitation shrimp / fish is to be banned. Indeed, even if the largest shrimp might be spared (and still it is not sure), the juveniles will be systematically swallowed! Remember that invertebrates are the natural prey of most fish. 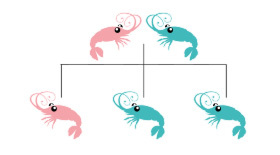 So, do not associate your shrimp with fighting fish, Guppy, Molly, Platy, Neon, Cardinalis, Apistogrammas and even less Scalars or Discus, etc... 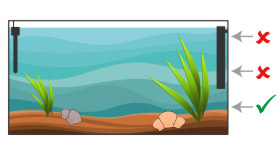 In short the principle is simple: most cohabitations with fish will be harmful to shrimps! 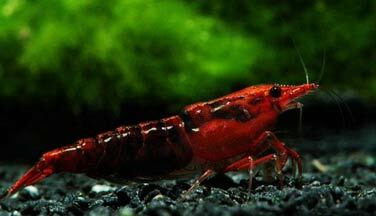 So prefer to install your shrimp in a specific aquarium, why not a nano-aquarium? Note however that cohabitation with Corydoras and Otocinclus is of no problem! (Be careful these fish do not live in nano-aquarium). How to breed this shrimp? The reproduction of this species is very easy since spontaneous when the optimal conditions of maintenance are respected. At the start, they will need a little time to acclimatize. Once properly installed and if they are sufficient, you should not be long in seeing females grained. Note that sexual maturity occurs around the age of 3/4 months. 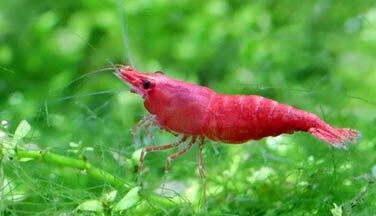 You will recognize your females with a stain located behind the head (particularly visible in the Cherry Shrimp). It’s actually an egg supply. After mating (which usually takes place at night), this task is transferred under the tail of the shrimp. You can then see the female regularly ventilate these eggs (it sometimes happens that a young female gets rid of her eggs during her first grain). The eggs can be white, orange or green. As the eggs mature, you will see tiny eyes appear inside! The eggs will brown in about 20 days. 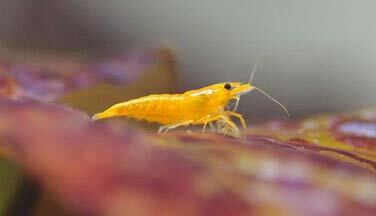 Each female can give 20 to 30 small shrimps once a month. The majority of young people will easily reach adulthood if there is no predator in the aquarium. 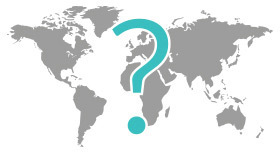 We understand then very quickly that with a base of a dozen individuals, we find ourselves invaded after a few months! Another advantage of invertebrates: problems of consanguinity are rather rare. 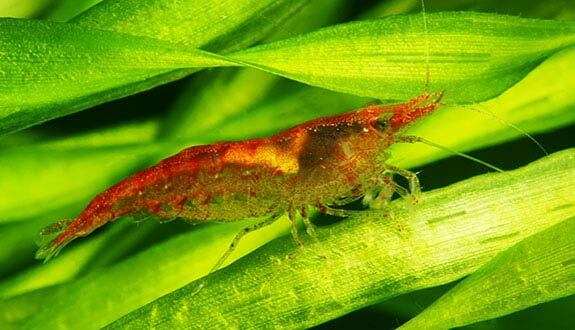 However, to ensure good general health and genetic renewal in your aquarium, do not hesitate to introduce shrimp from another strain from time to time. For example, why not trade with other amateurs? Juveniles are tiny shrimp already completely formed and autonomous. The young are born transparent. Their colour should appear 2 to 3 weeks later. Give them a lot of hiding by the vegetation, and especially mosses that will be very popular with young people as adults! Which aquarium for this shrimp? 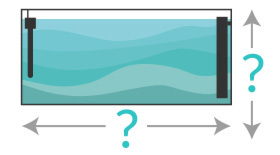 In theory, the volume of the aquarium does not matter. In practice, the smaller the bin, the more difficult the parameters are to stabilize. If you are starting out, start at least with 25 liters (5 imp gal / 7 US gal). 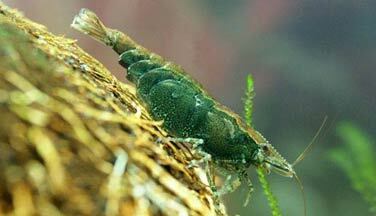 With regard to water parameters, Neocaridina are very tolerant and will easily settle in a wide range of parameters. It will however be necessary to avoid extremes. 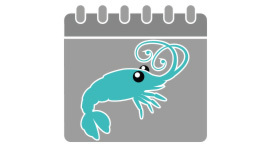 Just like fish, shrimps like clean waters and you will need to renew their aquarium water regularly (about 10 to 15% each week). For decoration, do not skimp on the plants! Indeed, shrimps like planted aquariums, offering them a dark and secure space. 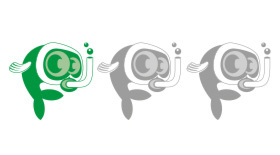 Do not forget the mousses (Christmas moss, Java Mousse, Clado, Pellia...) that shrimp loves! On the other hand, avoid plastic plants that are of no interest in the ecosystem of an aquarium. You can also provide hiding places like roots, tubes or clay pots... The more the shrimp have hiding places, the more they will feel safe, and the more they will rise! Finally, install some rocks that will remind their natural biotope. 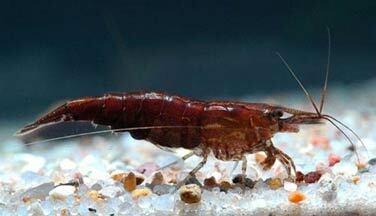 Dark gravel has been found to promote staining of Neocaridina. It also calms their fearful temperament. For their safety, install a protection at the entrance of the filter (stretched pantyhose for example) but without obstructing it. This prevents the shrimp from being sucked up by the filter and dying there (especially for juveniles). What are the colours and patterns of this shrimp? This shrimp is very hardy and quite resistant. It easily adapts to a wide range of different conditions. Moreover, its reproduction is very easy and spontaneous. This makes it an ideal shrimp for beginners. They are very sensitive to copper, a real poison for these invertebrates. To avoid contamination, thoroughly rinse any new plant before placing it in your bin. Also pay attention to fish medications that usually contain copper (read the precautions for use of the leaflet before use). 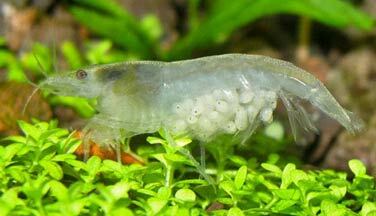 The Neocaridina maintain the spawning of the fish: as detritivores, they will clean the unfertilized or moldy eggs, leaving those which are healthy. Thus, they will be excellent allies to maintain a private spawn of adult spawners. 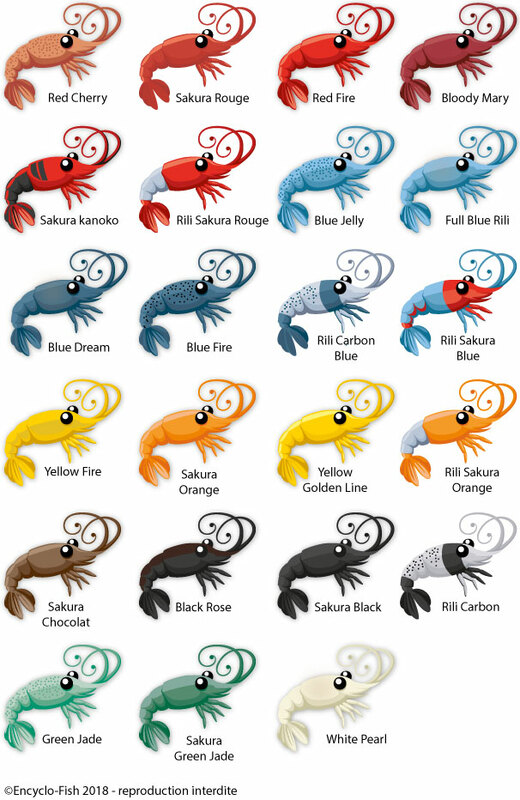 Following many selections, the colours and patterns of Neocaridina are nowadays very varied! However, in its natural environment, this shrimp is completely gray (note that there is almost no such natural form in pet shops). 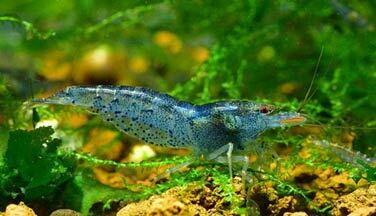 And about all these beautiful colours, Neocaridina breed each other regardless of their colour. However, the result of this mixture will give the young shrimps the natural colour of the species. If you want to keep the beautiful colours of your stump, do not mix the different colours of the shrimp in the same aquarium. 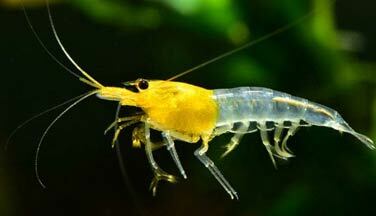 Shrimp have an exoskeleton that they leave when they grow: this phenomenon is called moulting. 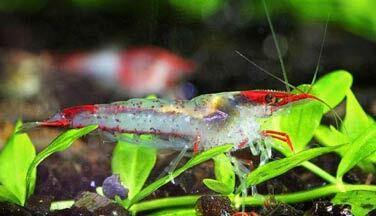 After moulting, the shrimp are «soft» and very fragile. Vulnerable, their instinct will push them to hide for a while after this operation. Moulting often occurs after a change of water. It should be noted that moults are processes of growth, then of aging. Thus, a shrimp that moults too often could die prematurely. You will see this old carapace: it is translucent and is the exact shape of the shrimp. 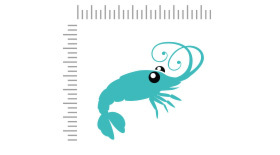 Tip: do not hesitate to check the little advertisements to find cheap shrimp! 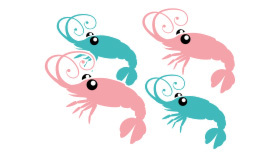 ATTENTION: never release your shrimp in the nature (lake, pond, river, river...)! It’s very bad for the ecosystem! Here are some pictures for the pleasure of the eyes!